It is a well-known fact that cigarette smoking is hazardous to your health. Nearly every cancer is associated with an increased risk among smokers. It's an irony of sorts, then, why more than 20% of U.S. residents are current smokers. The hazards of smoking are numerous, affecting even the unborn child as it sits innocently in its mother's womb. According to the American Lung Association, cigarette smoking is the most important source of disease and illness and/or premature death worldwide. Each year, 443,000 Americans lose their lives to smoking-related illnesses. This represents 1 in 5 deaths, making it the leading preventable cause of death in the U.S..
On average smokers die earlier than non-smokers (13 years for men and 14 years for women). Approximately 8.6 million Americans have at least one smoking-related illness. For every death in the U.S., there are 20 other people with at least one serious health condition linked to smoking. Smoking leads to 20-30% of low birth weight children, nearly 15% of preterm deliveries, and 10% of infant deaths. The U.S. spends more than 190 billion dollars per year in smoking-related healthcare costs and averages $4,260 in direct costs per adult smoker. Cigarettes contain more than 7,000 chemicals - 69 of these are known to cause cancer. Smoking is responsible 90% of cancer deaths and more than 80% of COPD deaths. Nicotine is a highly addictive drug, which, when inhaled, reaches the brain faster than any injectable drug, including heroin. This is part of the reason why quitting is so difficult. 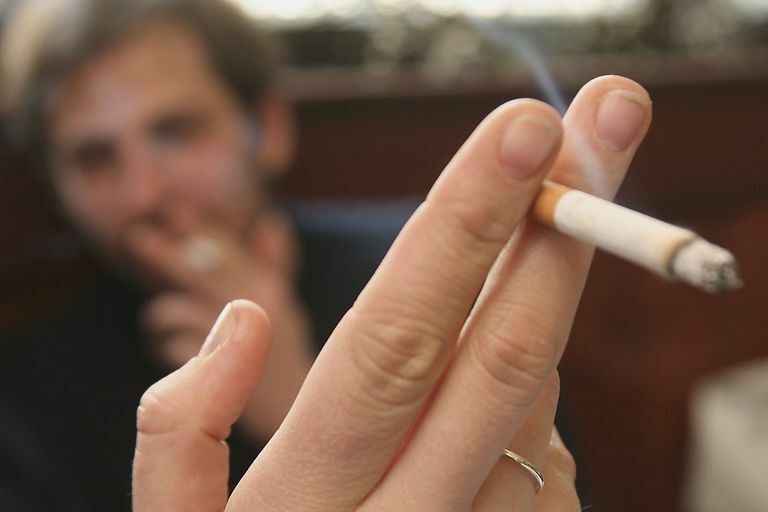 Smoking is associated with infertility in men. Parents who smoke can create health problems for their children, including exacerbation of asthma, increased frequency of colds and/or ear infections, and ​sudden infant death syndrome. Cigarette smoking is responsible for a number of serious illnesses including COPD, heart disease, stroke, high blood pressure, abdominal aortic aneurysm, pneumonia, gum disease, osteoporosis cataracts and many forms of cancer. It can also lead to infertility, slower healing wounds, and peptic ulcer disease. Among those who still smoke, chronic lung disease accounts for 73% of all smoking-related illnesses. In former smokers, chronic lung disease accounts for 50% of all smoking-related conditions. Every year, secondhand smoke is responsible for 3,400 lung cancer deaths and 46,000 heart disease deaths in the United States alone. Parental smoking leads to more than 200,000 asthma episodes and 709,000 visits for ear infections. Tobacco advertising plays a significant role in the addiction process as it encourages young people to begin a lifelong relationship with cigarettes before they are even old enough to understand the impact that smoking has on their health. In 2009, more than 5% of middle school students were current smokers while nearly 20% of all high school students reported being current smokers. Currently, there are 7 medications approved by the FDA to help people quit. Because quitting smoking often requires multiple attempts, stop smoking aids coupled with either individual, group or telephone counseling are highly recommended to increase the chances of a successful quit attempt. American Lung Association. General Smoking Facts. Accessed June 14, 2015. Centers For Disease Control. Health Effects of Cigarette Smoking. Accessed June 14, 2015. Are E-Cigarettes the Safer Choice for People With COPD? Can Wood-Burning Stoves Be Unhealthy for You and Your Home?